Plot: After a cyber-attack reveals the identity of all of the active undercover agents in Britain, Johnny English is forced to come out of retirement to find the mastermind hacker. Starring: Jake Lacy, Olga Kurylenko, Rowan Atkinson, Emma Thompson. 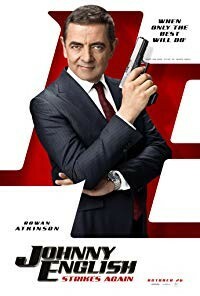 distributed by Focus Features «Johnny English Strikes Again» in the US movie theaters released on October 26, 2018 and has grossed over $127 million worldwide; dvd and blu-ray release date was set for January 22, 2019. Rent from Netflix and Redbox from January 22, 2019. «Johnny English Strikes Again» in the UK released in movie theaters on October 5, 2018. The movie released on dvd and blu-ray on February 18, 2019.